Various types of files, including the tracking data, can be exported out from Motive. This page provides information on what file formats can be exported from Motive and instructions how to export them. 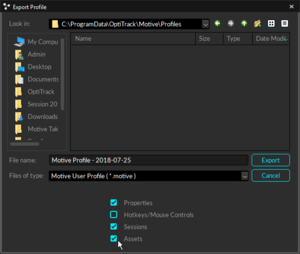 Tracking data export dialogue window in Motive. CSV export is selected and corresponding options are displayed. Make sure all rigid bodies are solve prior to export. Once captures have been recorded into Take files and the corresponding 3D data have been reconstructed, tracking data can be exported from Motive in various file formats. If the recorded Take includes rigid body trackable assets, make sure all of the rigid bodies are Solved prior to exporting. The solved data will contain positions and orientations of each rigid body. Step 1. Open and select a Take to export from the Data Management pane. The selected Take must contain reconstructed 3D data. Step 2. Under the File tab on the command bar, click File → Export Tracking Data. This can also be done by right-clicking on a selected Take from the Data Management pane and clicking Export Tracking Data from the context menu. Step 3. On the export dialogue window, select a file format and configure the correponding export settings. To export the entire frame range, set Start Frame and End Frame to Take First Frame and Take Last Frame. To export a specific frame range, set Start Frame and End Frame to Start of Working Range and End of Working Range. You can also use the navigation controls on the Graph View pane to zoom in or zoom out on the frame ranges to set the working range. See: Graph View pane page. Working range (826 ~ 3962) shown on the navigation bar at the bottom of the Graph View pane. Step 1. Under the Data Management pane, shift + select all the Takes that you wish to export. Step 2. Right-click on the selected Takes and click Export Tracking Data from the context menu. Step 3. An export dialogue window will show up for batch exporting tracking data. Step 4. Select the desired output format and configure the corresponding export settings. Step 5. 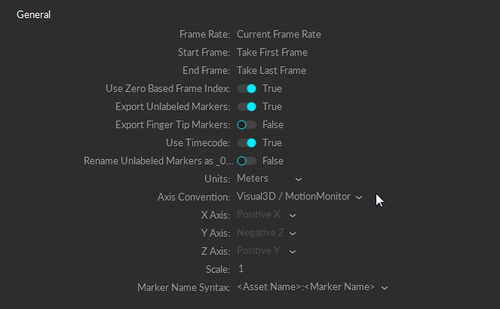 Select frame ranges to export under the Start Frame and the End Frame settings. You can either export entire frame ranges or specified frame ranges on all of the Takes. When exporting specific ranges, desired working ranges must be set for each respective Takes. 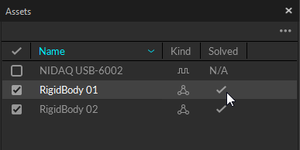 To export entire frame ranges, set Start Frame and End Frame to Take First Frame and Take Last Frame. 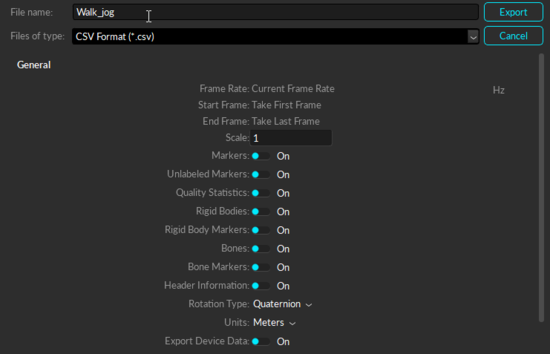 To export specific frame ranges, set Start Frame and End Frame to Start of Working Range and End of Working Range. 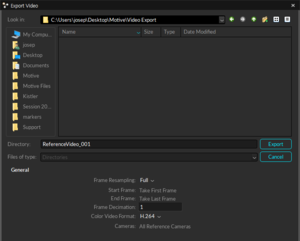 Exporting multiple Take files with specific options can also be done through a Motive Batch Processor script. For example, refer to FBXExporterScript.cs script found in MotiveBatchProcessor folder. A calibration definition of a selected take can be exported from the Export Camera Calibration under the File tab. Exported calibration (CAL) files contain camera positions and orientations in 3D space, and they can be imported in different sessions to quickly load the calibration as long as the camera setup is maintained. 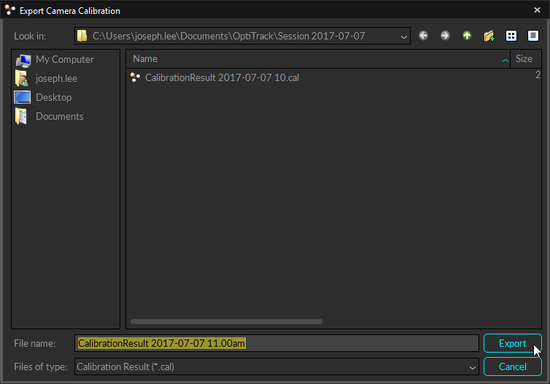 Read more about calibration files under the Calibration page. Assets can be exported into Motive user profile (.MOTIVE) file if it needs to be re-imported. The user profile is a text-readable file that can contain various configuration settings in Motive; including the asset definitions. When the asset definition(s) is exported to a MOTIVE user profile, it stores marker arrangements calibrated in each asset, and they can be imported into different takes without creating a new one in Motive. Note that these files specifically store the spatial relationship of each marker, and therefore, only the identical marker arrangements will be recognized and defined with the imported asset. 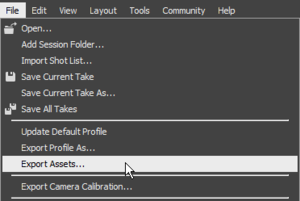 To export the assets, go to Files tab → Export Assets to export all of the assets in the Live-mode or in the current TAK file. You can also use Files tab → Export Profile to export other software settings including the assets. Important Update Note TRA/SKL files can still be imported into Motive, but they will be deprecated from the next release. This functionality will be replaced with the motive profile functionality. Starting from Motive 2.1, you can export just the Asset definitions into a Motive profile (*.MOTIVE) and re-import them in whenever necessary. In Motive 2.1, you will no longer be able to export out TRA/SKL files. Exporting Assetsinto the User Profile. Exporting user profile that includes assets. This dialogue window is from the Export Profile As... option. Recorded NI-DAQ analog channel data can be exported into C3D and CSV files along with the mocap tracking data. You can just follow the normal the tracking data export steps, and if the analog data exists in the TAK, they will also be exported. CSV Export: When exporting tracking data into CSV, additional CSV files will be exported for each of the NI-DAQ devices in a Take. Each of the exported CSV files will contain basic properties and settings at its header, including device information and sample counts. The voltage amplitude of each analog channel will be listed. Also, mocap frame rate to device sampling ratio is included since analog data is usually sampled at higher sampling rates. Note that the coordinate system used in Motive (y-up right-handed) may be different from the convention used in the biomechanics analysis software. When there is an MJPEG reference camera in a Take, its recorded video can be exported into an AVI file. The Export Video dialog window is located under the File tab. At the bottom of the export dialog, the frame rate of the exported AVI file can be set to full frame rate or a down-sampled to half, quarter, 1/8, or 1/16 ratio framerate. You can also adjust the playback speed to export a video with slower or faster playback speed. The captured reference videos can be exported into AVI files using either H.264 or MJPEG compression format. The H.264 format will allow faster export of the recorded videos and is recommended. Read more about recording reference videos in Data Recording page. Reference Video Type: Only compressed MJPEG reference videos can be recorded and exported from Motive. Export for raw grayscale videos is not supported. Media Player: The exported videos may not be playable on Windows Media Player, please use more robust media player (e.g. VLC) to play the exported video files. When a recorded capture contains audio data, an audio file can be exported through the Export Audio option that appears when right-clicking on a Take from the Data Management pane. 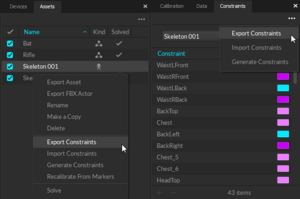 Skeletal marker labels for skeleton assets can be exported as XML files (example shown below) from the Data Management pane. The XML files can be imported again to use the stored marker labels when creating new skeletons. For more information on Skeleton XML files, read through the Skeleton Tracking page. Exporting skeleton marker XML template. This page was last modified on 8 April 2019, at 11:14.